I am swooning over this gorgeous dining room designed by the talented Molly Luetkemeyer. The first thing that catches my eye is definitely the whimsical jungle mural. 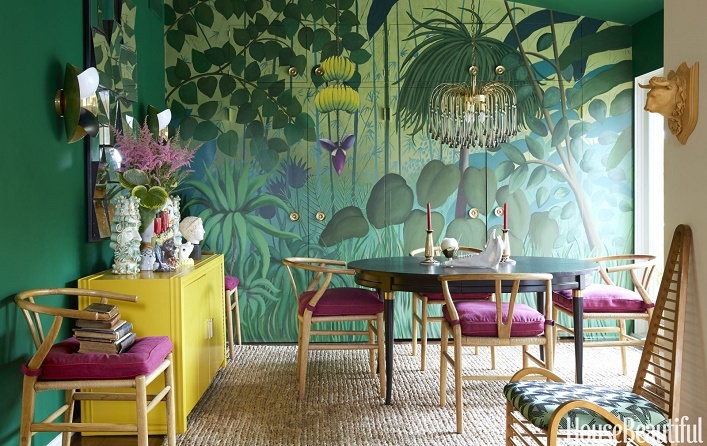 Not only the striking mural makes a great backdrop and a huge design statement, it immediately transport you to an imaginary jungle far, far away. The lovely vintage wishbone chairs work beautifully in the space without competing with the large wall mural, thanks to its light and airy design. The bright yellow chest adds a playful touch to the room while the stunning vintage chandelier creates a sense of casual, understated elegance. Bold, vibrant and imaginative, what's not to love about this magical room? Your thoughts? Stunning! Playful, and clever. Quirky. Love it.